After days like those with UXO Lao, we welcome scenes like these: a cold beer, a setting sun, the placid Sekong River in Attapeu. 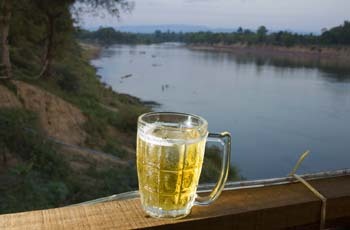 Lao is an ideal country for cocktail hour, especially at riverside restaurants like this little no-name place. We watch a passel of monks bathing in the bathwaters as we drink our beer and exchange language lessons with the Vietnamese waitress.